Is Your Lawn Struggling in the Shade? It’s a continual conundrum here in North Texas: You want a lush lawn, but you also want and need that large shade tree. Can the two happily co-exist? The bottom line is that turf grasses, like Bermuda, St. Augustine and Zoysia, are sun plants. They do not thrive in the shade and no amount of water or fertilizer will change that. For your lawn to thrive, it ideally needs a good 6-hours of sunlight. While certain varieties of turf grass can “tolerate” more shade, such as St. Augustine, it’s still not a shade plant. Even St. Augustine needs a good 4 hours of direct bright light in order to thrive. “But my neighbor has shade and their St. Augustine looks just fine”… Not all shade is the same. Your neighbor may have a different exposure or trees with higher canopies that let in more light to their lawn. Each landscape is different and many factors contribute to how much sunlight your lawn actually receives. Many homeowners will have their trees “thinned” to let in more sunlight. But this practice often only damages the tree without providing enough direct sun to the lawn. 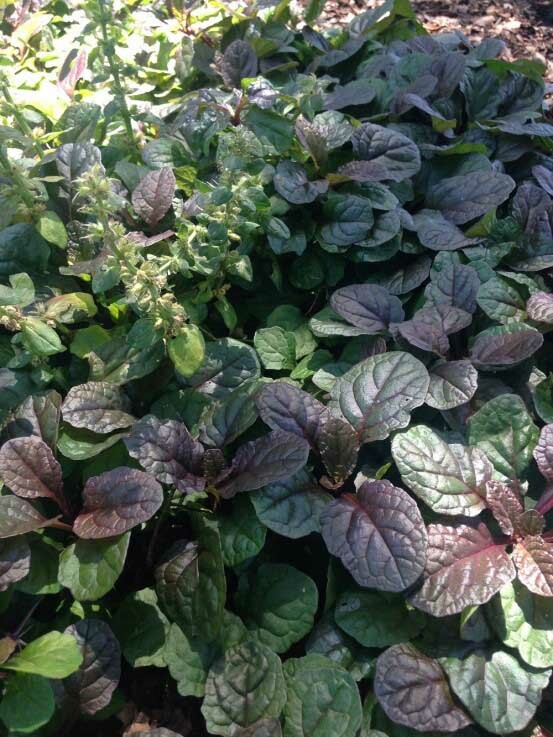 Ajuga ‘Bronze Beauty’ is a wonderful semi-evergreen perennial for shade. Persian ivy, Asian jasmine, moneywort, ajuga, lamium, mondo grass are just a few great options for shady landscapes. You can also extend your beds and plant more shade loving perennials such as hellebore, holly fern and violets. Regardless of whether you have lawn or groundcovers, the soil in your entire landscape still needs to be fed. All your plants, be they turf grasses, groundcovers, shrubs or trees, all will benefit from our Soil Building Program. For more turf alternatives to grass, check out our Pinterest Board here.